Chicken soup. Is there anything more comforting? No, I don't think so either. The majority of the time, I add noodles to my chicken soup, but once in a while just to mix it up, I'll add some rotini or farfalle or rice or tortellini or a variety of other starches. When I made this batch, I noticed I had a small bit of orzo in an opened box in the cabinet, so I threw that in and it was a nice departure from the usual noodles. 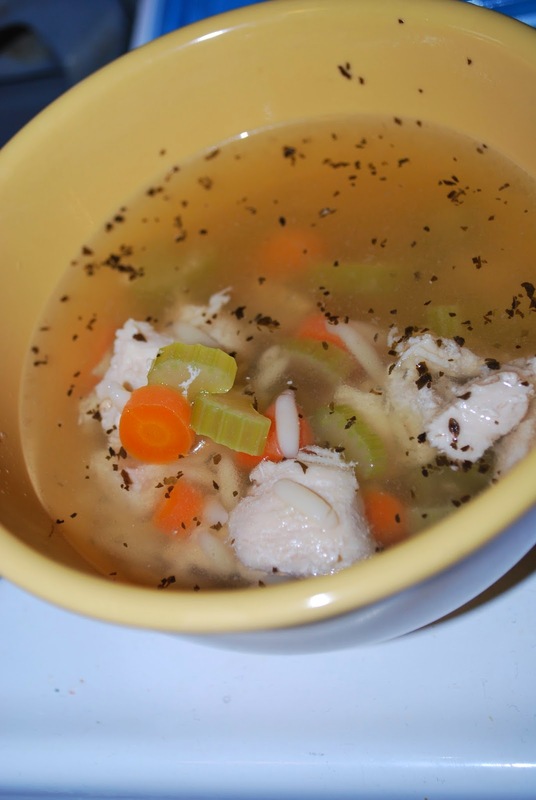 Boil cubes in water until dissolved and add chicken and vegetables. Boil for about 20 minutes and reduce to a simmer. Once chicken seems cooked throughout, remove and cut up. Add seasoning and continue to simmer, returning chicken to pot. Add orzo. Continue to simmer about 10 minutes or until orzo is done.